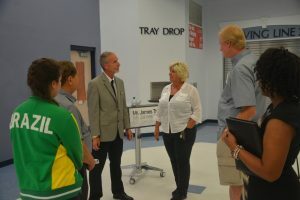 Last week the Flagler County School Board formally approved a three-year contract with James Tager as superintendent, after voting unanimously to hire him as Jacob Oliva’s replacement. Tager begins June 1, the day Oliva begins a job at the state Department of Education. Tager had been one of three candidates the school board interviewed on April 20. 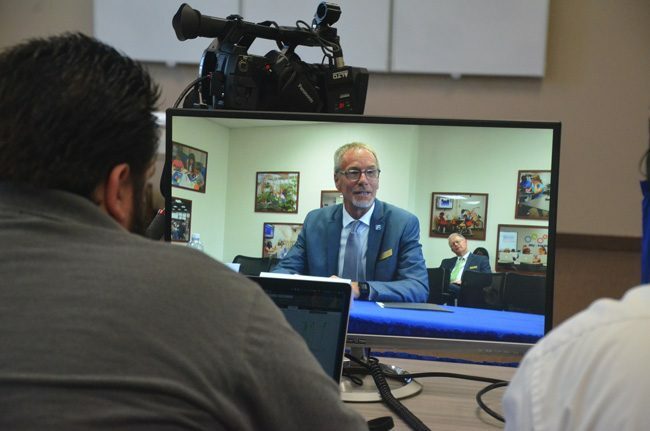 Tager, who is ending his tenure as a principal at Atlantic High School in Volusia County, last week participated in the Live Interview, answering the six questions below in writing. FlaglerLive: How, if at all, has zero tolerance failed, and how else in your experience have you seen today’s application of discipline, including suspensions and expulsions, fail? Parental non-involvement aside, what is a district’s most serious challenge when it comes to discipline, and how far beyond the school house door does school and district authority extend? For example, how comfortable are you with such things as Orange County schools’ social media surveillance program monitoring student activity? James Tager: The most effective piece is to approach discipline in a proactive stance. Zero tolerance policies rarely work and fail to get to the root cause. While your policies are there to offer protection to students and promote a safe learning environment that maintains a focus on a solid instructional culture, getting to the causes which lead to poor choices is the key to effectively change behavior. I know Flagler County has been working on reducing suspensions over the last several years. I believe protecting instruction time for students is critical. Education never stops at the schoolhouse door. If we are an effective influences on a student’s life, then our reach extends into the community, neighborhood, and even the home. We need to invest in counseling supports, look at partnerships with full family supports…reaching out to families to ensure their needs are being met. When a student does make a mistake, work in assisting correcting the mistake so it doesn’t re-occur. Much is being made these days of programs such as classrooms-to-careers, Flagler’s Flagships, Volusia County’s Academies, and so on. There’s a premium on business involvement and on business partnerships with schools. That’s all to the good. But where in your view does partnership with business end and pandering begin? What instances have you experienced where you have had not only to draw a line, but to push back when it has been crossed (or how would you foresee that happening)? Partnerships with our business community, no matter the program name are crafted to be a support to students. They provide mentorships, exposure to industries, opening up new horizons for a student who may not have otherwise thought about a particular career. When the focus is kept on developing the student, then the outcome is what you focused on. The key is in attracting businesses which embrace a true partnership belief and seek to be a good collaborator within the vision of the school district . As a result of the flagship K-12 experience students can complete high school with a college or career focus based upon a flagship/academy experience during their public school experience. What place do the arts hold in your hierarchy of what the district must provide students? And where do you draw the line between a student’s (or a student production’s) creative expression and censorship by a principal or faculty? My belief is that the arts and electives provide students the opportunity to grow or shine their individual talent or gift. In addition with graduation rate being one of my top priorities; I believe that the arts is a key factor toward motivating students from K-12 to attend school daily. I am aware that we have procedures in place for when a textbook or piece of literature/publication is challenged, but there is no such district-wide process for questions surrounding the other forms of expression. Certainly I will follow the lead of the school board in determining procedures in the area of creative expression questions that may pertain to artwork. Florida has a very broad interpretation of open government and transparency. Please give us your understanding of the state’s sunshine law and your honest evaluation of how comfortable you are working within it, and beyond it, given today’s prevalence of social media and broader media’s immediacy. It is my responsibility to work within the state’s sunshine law and to adhere to the direction of the school board. The Board and I are scheduled to attend a retreat in June to establish a positive working relationship with assistance and guidance from the Florida School Board Association. Transgender rights have belatedly become a matter of contention to the extent that few people in your position have not thought about the issue and, one hopes, considered how to address it. Summarize the policy you would recommend to a school board on how best to provide for the rights of transgender students in locker rooms and in day to day school facilities. Any transgender issues we encounter in our district, we address on a case-by-case basis. We work with the student and their family to ensure the best solutions in respect to their needs. I believe that all 13,000 students should be treated with dignity and respect. Temperamentally, how would you describe yours as a person and a leader? What would your colleagues say are your two biggest weaknesses (aside from working too much, caring too much or masking other such qualities in the form of faults)? And how controlling are you as an executive? To put it more colloquially, would you be considered a control freak? I look forward to the challenge of being a first time superintendent in Flagler County and consider it to be an honor and a privilege. Tempermentally I try to remain calm and collective in all situations. I would describe myself as a team player and a believer in the four pillars including Teaching & Learning, Instructional & Operational Innovation, Student & Community Engagement, and Leadership Development. When making decisions I tend to be methodical, data driven, and will seek the input of multiple stakeholders. Welcome to the Bermuda Triangle and good luck! Superintendent James Tager. Congratulations on your appointment. I/M/O your main efforts as to correcting disciplinary problems must be focused on the Middle School. Long neglected with a horrid “Do Nothing” Administrators (Now gone thank goodness ) Superintendent Jacob Oliva started the process of restoring the Middle School to a respectable Center for Learning. Oliva assigned a good Administrator Nathan Lovelette The drug problems and gang problems that had started to be seen are now under correction. You need to review this Middle Schools needs for further assistance. Please make sure you focus your attention on the Buddy Taylor Middle Schools and continue the process. Please make sure you speak to Principals Nathan Lovelette and ascertain if he needs more resources. If Nathan Lovelette continues to succeed I believe the disciplinary problems at the two High Schools in the future will be less. Now get rid of the school uniform policy that is not uniform throughout the district and focus on how our kids can be better educated and equipped with the tools they need to succeed in life–the cloths don’t make the grade—in fact make those who don’t feel comfortable wearing certain colors or collared shirts do worse than they would if they were comfortable with their appearance. There are teachers who dress worse than any student and they are required to wear uniforms. Inmates wear uniforms—get rid of them! It is the school board’s responsibility to ask the questions—–so let them do their job!